Home / 2012 / July / 31 / Moth repellents: Repulsive or not? The traditional mothball, with that weird musty scent, typically contains one of two chemical fumigants: naphthalene or paradichlorobenzene. These ingredients can be extremely dangerous if misused. To ensure safe and effective use of these products, it is important to follow the product’s label exactly and to know the signs of possible toxicity. Naphthalene was first registered as a pesticide in 1948, and it kills insects and repels some animals. It is a solid that turns into a vapor. The main routes of exposure to naphthalene are ingestion (mouth), inhalation (nose) and skin contact. Once inside your body, naphthalene has the potential to affect the liver, lungs and kidneys. Common symptoms of exposure are dizziness, headache and nausea. Additionally, some people are at risk of adverse reactions involving the blood if they have an uncommon genetic condition called G6PD deficiency. Sounds like a big risk just to get rid of a pesky moth. Paradichlorobenzene was first registered as a fumigant for moths in 1942. It too, goes from a solid to a vapor and poses many of the same risks as its relative, naphthalene. Irritation of the eyes and nose, nausea, dizziness and vomiting are signs of over exposure but paradichlorobenzene has been known to be less toxic relative to naphthalene. As few as one mothball ingested can cause symptoms in a child. So if you suspect yourself or a loved one has been exposed to these chemicals or experiences any of the above mentioned symptoms call the Illinois Poison Center at 1-800-222-1222. There are a couple natural alternatives to the products containing naphthalene or paradichlorobenzene. Instead of contaminating your clothes with these stinky chemicals, you can try a natural repellent or fumigant. Cedar chips or blocks, and cedar oil are great for long-term protection of sensitive fabrics. 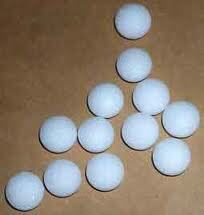 Another widely used natural repellent is camphor, which comes in flake, ball or cake form. It is important to note that although it is a natural repellent; camphor can be even more toxic than traditional mothballs if misused, particularly if ingested by a child. The main symptoms of camphor poisonings can occur rapidly within 5-20 minutes. They include agitation, nausea, stomach upset, vomiting, and seizures. We don’t suggest its use due to its toxic potential. You can find other natural alternative moth repellents in your kitchen, such as cinnamon sticks, peppercorns, cloves, lemon peels and bay leaves. Hopefully after reading this you will be able to safely and effectively use these products and have a better understanding of the different options out there for dealing with those pesky moths. Always feel free to call the Illinois Poison Center. No question too big or small, just call 1-800-222-1222!